Works by Nikolai Roerich and Ivan Aivazovsky to be auctioned November 26. Among lots expected to generate major interest among collectors and dealers is Aivazovsky's Arrival of the Columbus flotilla to the American coast. 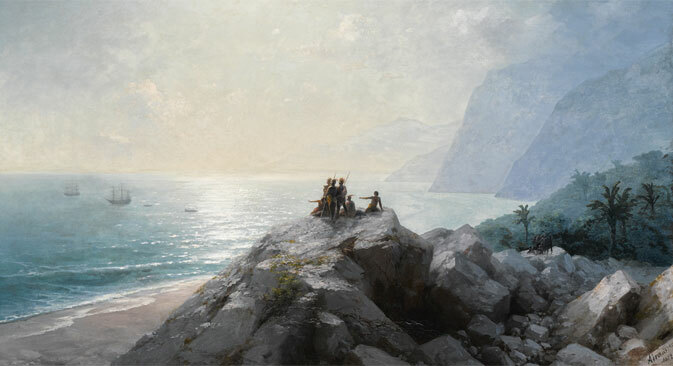 Paintings by Nikolai Roerich and Ivan Aivazovsky will be the main lots at Bonhams' Russian Sale, November 26. One of the key lots will be Aivazovsky's Arrival of the Columbus flotilla to the American coast (1892), with a pre-sale estimate of £700-900,000. This painting is part of a series of five paintings that the Russian maritime artist dedicated to the life of Columbus in 1888. The painting is considered "one of the grandest and most beautiful" in the series. The auction also includes 11 paintings by Nikolai Roerich, all from private collections. The works include sketches of theatre decorations, landscape paintings of Finnish lakes, canyons in Arizona, snowy Alpine peaks and mountain ranges in Mongolia and Tibet, as well as the monumental symbolic compositions Roerich created during his travels. Significant interest is expected when Roerich's Ecstasy, comes under the hammer. Depicting a hermit standing in silent contemplation on top of a mountain, Roerich painted it in 1918 in Finland where he lived during the Russian Revolution. Part of the permanent collection of the Roerich Museum in New York until 1935, in 1971 it was gifted to Brandeis University in Massachusetts, later becoming part of a private collection. The painting's auction estimate is available to bidders only on request. Among other Roerich paintings in the auction are The gates of Tmutarakan (1919), Tulola (1918) and The gifts (1910), with sale estimates of £200-300,000, £250-350,000 and £400-600,000 respectively. The highest price achieved for a Roerich painting was for Miracle of Madonna Laboris which sold at Bonhams in June 2013 for a record £7.9 million. Among other sought-after lots is avant-garde artist David Shterenberg's Still life with fruit. Created in the late 1920s, it has a catalogue estimate of £400-600,000 pounds. The sale also includes painter and graphic artist Alexander Yakovlev's Loge de Théâtre à Pekin. The rarely seen work, one of several canvases painted in 1918 during a two-year journey through China, has an estimate of £500-700,000. The work was first presented to the public in 1920 at Yakovlev's personal exhibition at the Galerie Barbazanges in Paris. It has remained in private collections since 1928 when banker and art collector Baron Lambert de Rothschild of Belgium acquired it. The sale also includes Russian arts and crafts items, from monumental porcelain vases produced by the Imperial Porcelain Factory in St. Petersburg, to Fabergé gold and enamel miniatures.